When I sent in a freedom of information request, in October 2012, asking for the South London and Maudsley NHS Foundation Trust investigation report into an incident involving a massive police deployment that happened earlier that month at one of the Trust's mental health ward, I expected to receive the report within a few months. It took close to two and half years and involved sending a dozen of freedom of information requests to the Trust, the Metropolitan Police, the Independent Police Complaints Commission, Monitor and the Care Quality Commission as well as requesting many internal reviews and making several complaints to the Information Commissioner’s Office who issued two related decision notices. 2013-08-29 – Redacted 11-page summary report with large amount of text deleted (and not blacked out as redacted text should be). 2014-02-28 – Redacted 12-page summary report with large amount of text blacked out (with the blacking out poorly done so that the blacked out text could be copied/pasted!). 2014-04-21 – Fully unredacted 12-page summary report. 2014-05-28 – Heavily redacted 105-page full report. 2015-02-25 – 105-page full report with only personal information redacted. The full report lists what the Trust and the Metropolitan Police have been covering up during all this time. My investigation has been written up in the Saturday 9 May editions of The Independent (pdf and below) and i (pdf). Note that, at the time of writing, the online version of The Independent's article is abruptly cut in the middle of the article (surprisingly where the text finishes on the first page of the article in the print edition, as if the online version was created from the printed paper). 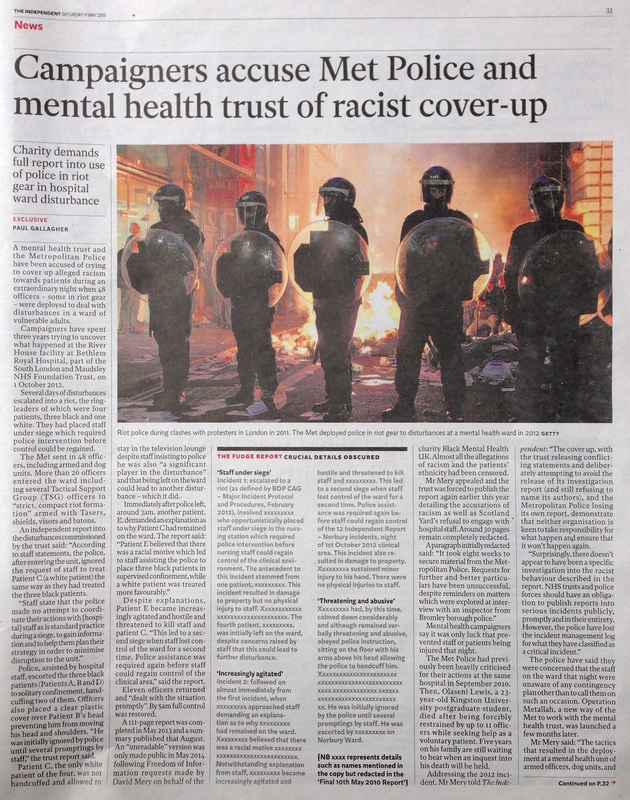 A mental health trust and the Metropolitan Police have been accused of trying to cover up alleged racism towards patients during an extraordinary night when 48 officers – some in riot gear – were deployed to deal with disturbances in a ward of vulnerable adults. Campaigners have spent three years trying to uncover what happened at the River House facility at Bethlem Royal Hospital, part of the South London and Maudsley NHS Foundation Trust, on 1 October 2012. Several days of disturbances escalated into a riot, the ringleaders of which were four patients, three black and one white. They had placed staff under siege which required police intervention before control could be regained. The Met sent in 48 officers, including armed and dog units. More than 20 officers entered the ward including several Tactical Support Group (TSG) officers in “strict, compact riot formation” armed with Tasers, shields, visors and batons. An independent report into the disturbances commissioned by the trust said: “According to staff statements, the police, after entering the unit, ignored the request of staff to treat Patient C (a white patient) the same way as they had treated the three black patients. Police, assisted by hospital staff, escorted the three black patients (Patients A, B and D) to solitary confinement, handcuffing two of them. Officers also placed a clear plastic cover over Patient B’s head preventing him from moving his head and shoulders. “He was initially ignored by police until several promptings by staff,” the trust report said. Patient C, the only white patient of the four, was not handcuffed and allowed to stay in the television lounge despite staff insisting to police he was also “a significant player in the disturbance” and that being left on the ward could lead to another disturbance – which it did. Despite explanations, Patient E became increasingly agitated and hostile and threatened to kill staff and patient C. “This led to a second siege when staff lost control of the ward for a second time. Police assistance was required again before staff could regain control of the clinical area,” said the report. Eleven officers returned and “dealt with the situation promptly”. By 5am full control was restored. A 111-page report was completed in May 2013 and a summary published that August. An “unreadable” version was only made public in May 2014 following Freedom of Information requests made by David Mery on behalf of the charity Black Mental Health UK. Almost all the allegations of racism and the patients’ ethnicity had been censored. Mr Mery appealed and the trust was forced to publish the report again earlier this year detailing the accusations of racism as well as Scotland Yard’s refusal to engage with hospital staff. Around 30 pages remain completely redacted. Mental health campaigners say it was only luck that prevented staff or patients being injured that night. The Met Police had previously been heavily criticised for their actions at the same hospital in September 2010. Then, Olaseni Lewis, a 23-year-old Kingston University postgraduate student, died after being forcibly restrained by up to 11 officers while seeking help as a voluntary patient. Five years on his family are still waiting to hear when an inquest into his death will be held. Addressing the 2012 incident, Mr Mery told The Independent: “The cover up, with the trust releasing conflicting statements and deliberately attempting to avoid the release of its investigation report (and still refusing to name its authors), and the Metropolitan Police losing its own report, demonstrate that neither organisation is keen to take responsibility for what happen and ensure that it won’t happen again. The police have said they were concerned that the staff on the ward that night were unaware of any contingency plan other than to call them on such an occasion. Operation Metallah, a new way of the Met to work with the mental health trust, was launched a few months later. Mr Mery said: “The tactics that resulted in the deployment at a mental health unit of armed officers, dog units, and TSG officers with Tasers drawn are clearly wrong. Such tactics cause distress to the vulnerable individuals housed there. The apparently racist behaviour of TSG officers involved is unacceptable. A trust spokeswoman said the report had been redacted on legal advice "for reasons of patient and public safety, and patient confidentiality… to maintain security arrangements used in a forensic mental health facility and to protect patient and public safety”. She said: "The report published on the trust website provides a clear and independent account of what happened on 1 October 2012. The trust's intention was to publish the report in the interests of transparency while using the correct application of the FoI Act to ensure that the identity of patients and their security was not compromised. "Following the investigation in 2013, the trust has taken action to address all recommendations made in the report to prevent a similar incident recurring. She said the response was based on "using the widest range of resources available during a highly charged incident by deploying resources appropriate to bring the situation under control, while ensuring the safety of staff and patients. The Metropolitan Police Service has received no complaint in relation to the incident. Should any complaint be received it would be thoroughly investigated." Incident 1: escalated to a riot (as defined by BDP CAG – Major Incident Protocol and Procedures, February 2012), involved xxxxxxxxx who opportunistically placed staff under siege in the nursing station which required police intervention before nursing staff could regain control of the clinical environment. The antecedent to this incident stemmed from one patient, xxxxxxxxx. This incident resulted in damage to property but no physical injury to staff. Xxxxxxxxxxxxxxxxxxxxxxxxxxxxxxxxx. The fourth patient, xxxxxxxxx, was initially left on the ward, despite concerns raised by staff that this could lead to further disturbance. Incident 2: followed on almost immediately from the first incident, when xxxxxxxxx approached staff demanding an explanation as to why xxxxxxxxx had remained on the ward. Xxxxxxxxx believed that there was a racial motive xxxxxxxxxxxxxxxxxxxxxxxxxxxxxxxx. Notwithstanding explanation from staff, xxxxxxxxx became increasingly agitated and hostile and threatened to kill staff and xxxxxxxxx. This led to a second siege when staff lost control of the ward for a second time. Police assistance was required again before staff could regain control of the 12 Independent Report – Norbury incidents, night of 1st October 2012 clinical area. This incident also resulted in damage to property. Xxxxxxxxx sustained minor injury to his hand. There were no physical injuries to staff. Xxxxxxxxx had, by this time, calmed down considerably and although remained verbally threatening and abusive, obeyed police instruction, sitting on the floor with his arms above his head allowing the police to handcuff him. Xxxxxxxxxxxxxxxxxxxxxxx xxxxxxxxxxxxxxxxxxxxxxxxxxxxx xxxxxxxxxxxxx xxxxxxxxxxxxxxxxxxxxxxxxxxxxxxx. He was initially ignored by the police until several promptings by staff. He was escorted by xxxxxxxxx on Norbury Ward.